Summary: This example shows how to create pie and doughnut charts in F#. The input data in this example is an F# list of tuples containing the names of political parties and their respective numbers of elected candidates. 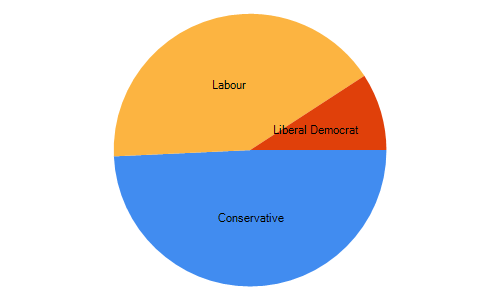 The example demonstrates how to display a pie/doughnut chart showing the proportion of seats taken by each party. 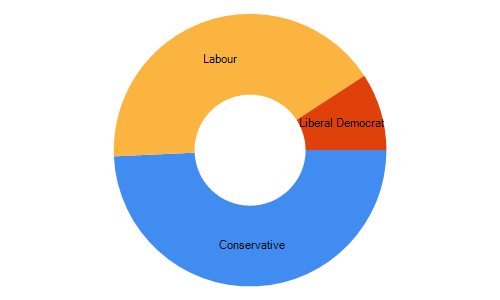 A sample doughnut chart is shown below. When using F# Interactive, each of these examples needs to be evaluated separately. This way, F# Interactive invokes a handler that automatically shows the created chart. The first example specifies the data source as a single list that contains two-element tuples. The first element of the tuple is the label and the second element is the value. The second example creates a doughnut chart instead of a pie chart.